Facebook has revealed its plans to connect the two-thirds of the world that has no net access, using drones, satellites and lasers. The announcement has been made on Facebook platform by founder Mark Zuckerberg. The move will put Facebook in direct competition with Google, which is planning to deliver net access via balloons. Facebook and Google want to extend their audiences, especially in the developing world. Details about Facebook’s plan were scant but it will include a fleet of solar-powered drones as well as low-earth orbit and geosynchronous satellites. Invisible, infrared laser beams could also be used to boost the speed of the net connections. Last year Facebook and other technology companies launched internet.org to help bring net access to the huge swathes of the globe that are still not connected. Facebook has already teamed up with telecoms operators in the Philippines and Paraguay to double the number of people using the internet in that region. “We’re going to continue building these partnerships, but connecting the whole world will require inventing new technology too,” Mark Zuckerberg said in his post. To bring the project to fruition, Facebook has set up a Connectivity Lab that will include experts in aerospace and communication technology, from NASA’s jet propulsion lab and its Ames research centre. 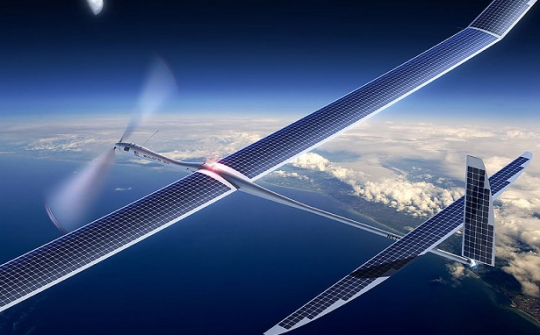 It has also hired a five-member team that worked at British firm Ascenta, whose founders developed the Zephyr, which holds the record for the longest-flying solar-powered unmanned aircraft. Earlier this month there were rumors that Facebook was interested in buying drone-maker Titan but there was no mention of this in the announcement.